Spice Finches, also called the Nutmeg Mannikins, are excellent for the beginner. Besides being gentle and hardy, they are inexpensive and adjust easily to cage or aviary life. They are easy to keep and will live for many years. The Spice Finch gather in small groups in the wild. They are very peaceful and sometimes their groups will be mixed with a variety of other small birds. Spice Finches are very hardy and dealers in India have been known to dye this little bird different colors, especially green, and offer them for sale as "painted finches". This must not be confused with the real Painted Finch (Emblema picta)! Description: Spice Finches reach a size of 4 3/4" (12 cm). They have a bluish-black bill. The head, throat, and neck are a chestnut brown, going into a chocolate brown on the top and sides of the neck, and usually darker on the head. The under parts are a whitish buff. The breast and sides are a brown with a dark brown scalloped edging to the feathers. Care and Feeding: Fresh food and water must be provided daily. A good finch seed mix will provide their everyday preference for a variety of millet and grass seeds and is readily available at a pet store. In a separate cup you can offer green foods, such as lettuce, spinach, celery tops, and chickweed. Other supplements include green seeds, sprouted seeds, egg foods, and mealworms. Finch treats of seed with honey, fruits and vegetables are fun for your bird too, as well as nutritious! Housing: Spice Finches do well indoors in a cage, but will need to be in an aviary if you wish them to rear young. Place the cage where it is well ventilated though free from drafts, and against a wall at eye level. It should have good light but be away from doors and windows where direct exposure to sunlight can make it overly warm. Spice Finches also do very well in an aviary or a bird room. The screening should be 3/8" square mesh. Dishes for food, water, grit and bathing water must be included along with perches and nests. Leafy branches, tall grasses and reeds, and dense bushes will make the space more enjoyable for the finches as well as providing nesting materials. Although finches require very little time, a clean environment as well as fresh food and water daily is a must to prevent disease and illness. The basic cage care includes daily cleaning of the water and food dishes. Every two to three days change the paper on the bottom of the cage and sprinkle it with about 1/8" of fresh grit. Weekly wash and dry the entire cage, including the perches. Spice Finches are always active and energetic. Breeding/Reproduction: Spice Finches are not too difficult to breed in an aviary and there you can house them in groups. However, they generally will not breed in a cage. It is difficult to tell the differences in the sexes, but the male will perform a courtship dance to his mate. They like voluminous nests and will build them using nesting materials such as long grass leaves, plant stems and coconut fiber. They will line the nest with soft materials such as moss and feathers. The female will lay a clutch of 3 to 7 eggs and will need to have lots of green seeds, sprouted seeds, greens, egg food, and mealworms to feed the hatchlings. Potential Problems: Spice Finches are very hardy birds and almost all illnesses can be traced to improper diet, dirty cages, and drafts. A balanced diet and plenty of exercise will prevent most illnesses. Know your bird and watch for real drastic changes as indications of illness. 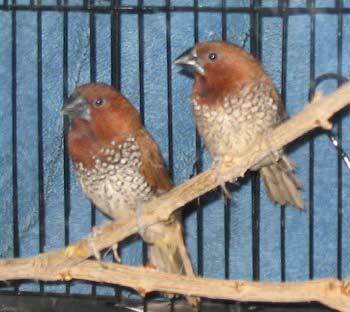 Availability: Spice Finches are readily available in the pet industry and are very inexpensive little birds. Right now I'm looking out my window and watching 12-15 Nutmeg Mannikins feed from my feeder. They've been here the last three years and are breeding. Each year there are more and more. There are several juveniles that are just starting to turn the darker color on top and get their striped feathers underneath. They're adorable little birds. They arrive in a large flock to feed in the mornig and again in the afternoon and early evening. I live in Fullerton, California. I'm having the same experience in Santa Barbara. It seems that the cute little nutmeg mannikins can make it just about anywhere. Lucky us.